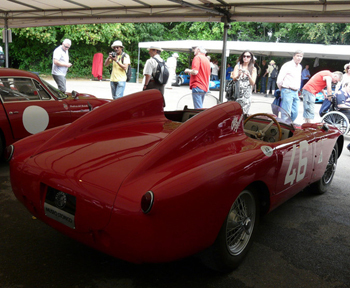 The Museo Storico Alfa Romeo turned up at the Goodwood Festival of Speed last weekend with its usual array of historical masterpieces, this year topped off with an appearance by a fabulous Alfa 6C 3000 CM that was raced half a century ago by Juan-Manuel Fangio. 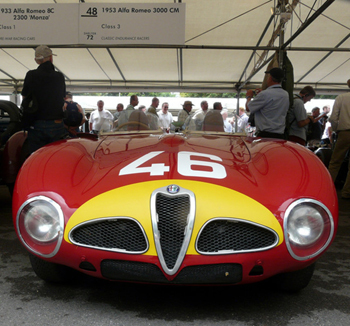 The Museo Storico Alfa Romeo turned up at the Goodwood Festival of Speed last weekend with its usual array of historical racing masterpieces, this year's cars topped off with an appearance by a fabulous Alfa 6C 3000 CM that was raced half a century ago by Juan-Manuel Fangio. It has become an annual tradition for Alfa Romeo's official museum, located in Arese, Milan, to make the long journey to Goodwood in England with a selection of its working exhibits that take to the hillclimb, reviving evocative memories of the brand's win-laden history for the tens of thousands of passionate fans who cram into the estate each year. In the "Cathedral Paddock" the historic entries from the Museo Storico Alfa Romeo always take centre stage. This year the cars brought over from the Arese museum included the 1924 P2 Gran Premio which won the first World Championship in 1925 driven by Gastone Brilli-Peri; the 8C 2300 Tipo Le Mans which was purchased by Sir Henry Birkin in 1931, and the 33 TT 12 which brought the 1975 World Manufacturer’s title to Alfa Romeo. Joining them under the awnings in the Cathedral Paddock was the 6C 3000 CM was a stunning driven by none other than Juan Manuel Fangio. The 6C 3000 CM (Competizione Maggiorata) was developed in 1952 from the 6C 3000 racer which had been built by Alfa Romeo in 1950 but which had never progressed beyond a brief outing. The 6C 3000 CM, featured a slippery body created by coachbuilder Colli, and although it had evolved from the 6C 3000 base, key changes included increasing the capacity of the 6-cylinder, 3.0-litre to 3,495cc, with a resulting 275 bhp that gave it a top speed of over 155 mph. Just a handful of these muscular cars were built, split between coupé (4) and spider (2) specifications, although they were to enjoy a very short competition career. Legendary Argentinean driver Juan-Manuel Fangio raced a coupé version of the 6C 3000 CM to second place in the gruelling 1953 Mille Miglia, and then went on to win the inaugural Gran Premio Supercortemaggiore in the fabulous spider example that now belongs to the official museum. The 6C 3000 CM also raced in the Le Mans 24 Hours that year, and in the hands of Fangio, this time with Onofre Marimon sharing driving duties, it however retired after three hours with piston failure. The story of the 6C 3000 CM didn't end there though. One spider was fitted with a 3.0-litre engine to comply with new international sports car regulations and called the 6C 3000 PR, for Passo Ridotto or "reduced pace" while these racing cars were also used as test beds by Alfa Romeo, fitted with disc brakes, during that era. The six-strong 6C 3000 CM series of cars went on to have interesting post-racing lives, with Argentinean President Juan Peron having one rebodied by Boano for road use, while Italian designer Pinin Farina was given one which he used as a basis for the Alfa Romeo Superflow concept which he showed in public to great acclaim at the Turin Motor Show in 1956 and which he continued to evolve until it became the Alfa Romeo 3500 Supersport, presented at the Geneva Motor Show in 1960. Two historic Alfa Romeo concept cars were also brought over by the Museo Storico Alfa Romeo to Goodwood last weekend and entered in the Cartier Style et Luxe in the Serious Wedge – Studies in Angular Sports Car Design 1965-1980 category, both of which were designed by Bertone. The 1968 Alfa Carabo concept marked a revolutionary stage in supercar design, with its hydropneumatic-powered gull-wing doors and multi-coloured one way glass windows. Yet another demonstration of Bertone’s experimental forward thinking design was the 1978 Najavo, which represented a concerted effort to evolve new aerodynamics focused in the direction of a sporty coupe design. The museum didn't go home unrewarded as it packed up with a class-winning trophy for the Carabo. The Alfa Romeo stand at the Goodwood Festival of Speed also featured both the Alfa 8C Spider and Alfa 8C Competizione sports cars, as well as the compact MiTo. Joining these two cars on the official stand was the regular Spider, Brera S which was developed in conjunction with Prodrive, and 159. 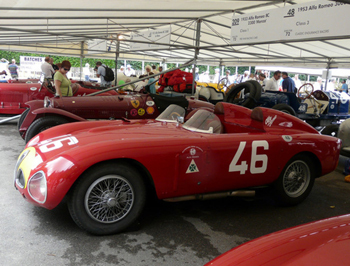 Alfa Romeo was also a sponsor of the 2009 Goodwood Festival of Speed.